Resonator Improv should be heard over headphones. It uses samples from an hour-long improvisation at the Resonator Festival, University of Central Lancashire, July 2007. For the duration of the performance I was inside a two-man tent manipulating found sound objects. The sounds were carried via my in-ear microphones to the audience who sat outside the tent listening over headphones: they heard almost exactly what I heard, including the spatial cues applied to the sounds by my head and ears. In addition to the importance given to the spatial positioning of the sounds, a piece like this privileges timbre, texture and gesture over pitch, harmony and pulse. 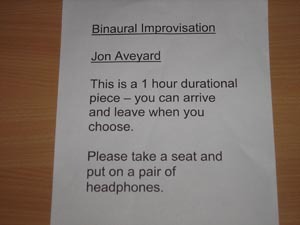 Jon Aveyard is a composer, audio artist and interdisciplinary performer. His current work involves bringing together skills practiced in acousmatic composition, soundwalking and interdisciplinary improvisation, often making use of in-ear microphones to relay sounds for headphone playback in performances and installations.